Dear one, it is a new time. It is a new moment. When you cling to the status quo, you are clinging to the way things used to be. Sometimes it feels safer to hold to the old way. Change can be frightening and yet, is your world not changing constantly? In holding on to the status quo, you are clinging to a thought of how something used to be, when you have the power to change it for the better this very moment. There is tremendous power in your thoughts. A thought is like a prayer to the universe, asking for what you want. If your thoughts are unconscious, if fears play a large part in what goes on in your mind, in effect you are asking for the things that frighten you to come into your life. Fear is part of the status quo and the greatest fear seems to be of the unknown. Yet it is not possible to always know exactly what is to be. You are being to asked to let go of your fears and to allow the power of the light of God to guide, nourish and protect you. Letting go is a moment to moment process. It is surrendering to the flow of life. Let go into the light, which is the flow of God moving within you at every moment. The Divine Presence is the only constant in the midst of change. This is a truth you can trust. Is not the power of light and love a greater attraction than fear and doubt? It is your attachment to wanting things never to change that holds you back. 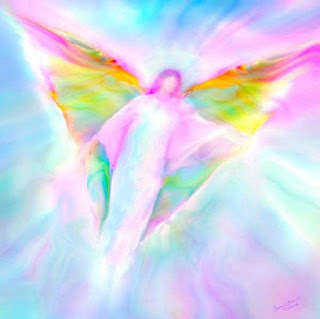 Simply ask clearly for what you want from the Higher Power and the Angels. All the assistance you need is available to you, if you but ask. When you are free from old fears and attachments, you will know the freedom and joy of your truth. Your truth is always what makes you happy, and this is Divine Will for you at all times—God wants you to be happy. Pray to live in the light of your truth. Know that you are divinely guided at all times. Ask for assistance to let go of fears that no longer serve you. Allow the grace of the Angels to work through you knowing you are profoundly loved.